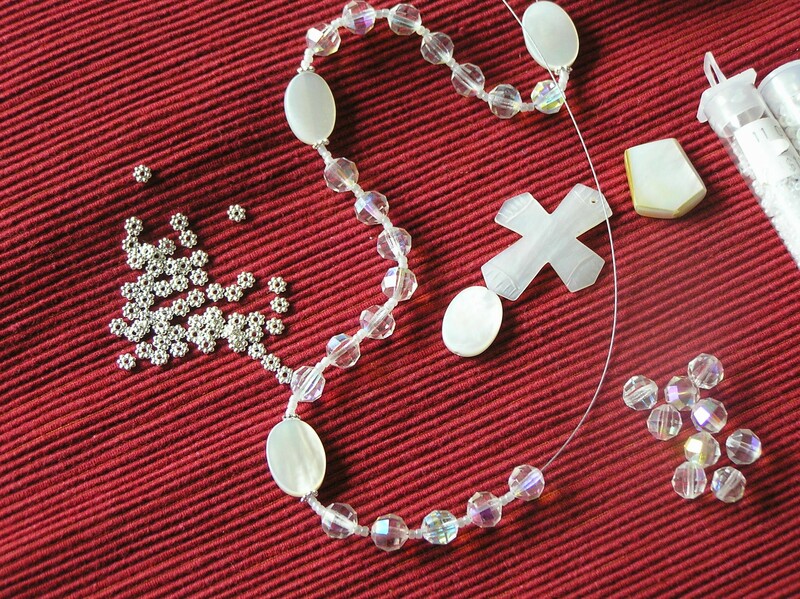 June is the month of weddings (yeah – I was married in May) and so I thought some of you out there might be interested in making a special set of prayer beads for the brides-to-be in your lives. Almost everything you see here came from my local independent bead store, Berkeley’s ab-fab Baubles and Beads. The cross is made from mother-of-pearl shell with a nice pinkish hue overlaying the white. The oval beads and the pentagonal bead are also a highly polished mother-of-pearl. I know I paid less than a dollar for each of those – I think. 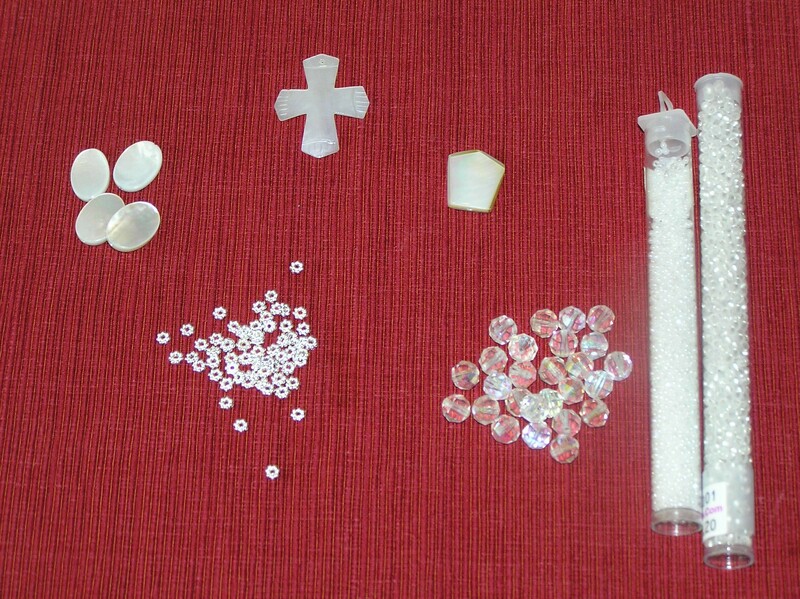 There are two tubes of seed beads, a size 11 white to go between the beads on the circlet and a size 8 white seed bead to go on the stem. These bigger seed beads have holes large enough to take the two strands of flexible beading wire I will use in the stem. And I am using small daisy wheels with a silver finish. 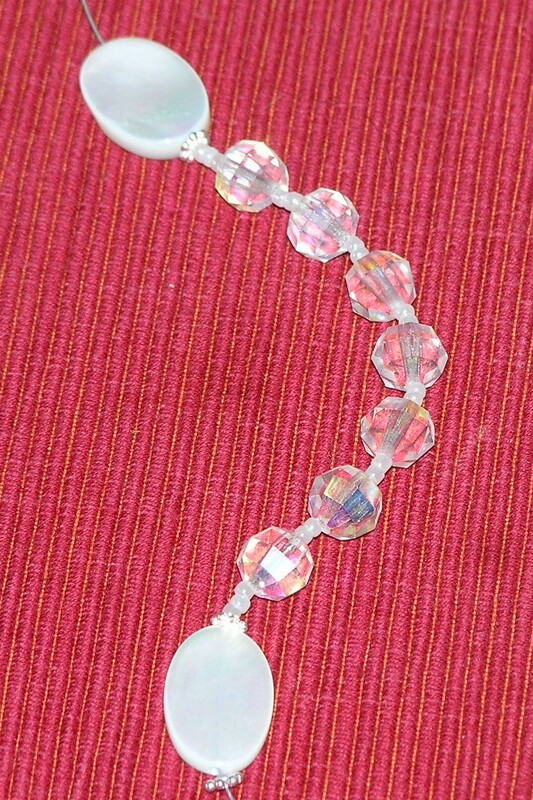 The only thing I got elsewhere are the faceted crystal beads that make up the main part of the prayer beads’ circlet. These I bought at a local antiques flea market. I think I paid about $20 for a vintage necklace that had about 50 or 60 of these iridescent, aurora borealis faceted beads. I looooooove them and still have enough left for a bracelet and some earrings. Or another set of prayer beads! My bride-to-be friend is a not a Catholic, so I decided to make her an Anglican/Protestant form of prayer beads. But as I was stringing them, I decided to do something a bit different – to create my own form of prayer beads, a kind of hybrid between the Anglican/Protestant form and the Catholic rosary. I made the circlet of the prayer beads in the Anglican/Protestant format, with 28 weeks beads, divided in four groups of seven, divided by four cruciform beads, which represent the arms of the cross. But on the stem, – which, in the Anglican format, traditionally has a cross or other terminal charm, an invitatory bead – I decided to add three additional beads, like the Catholic rosary stem’s three Our Father beads. I decided these will represent the three major marriage vows: to love, to honor and to cherish. I will create or find three special prayers to give her for these three beads. I encourage you to feel free, whenever you make prayer beads, to break away from the traditional forms if you are comfortable doing so. You can turn this same set of bridal prayer beads into an Anglican/Protestant rosary by subtracting the three extra beads from the stem, and you can make it into a traditional Catholic rosary by adding more beads. 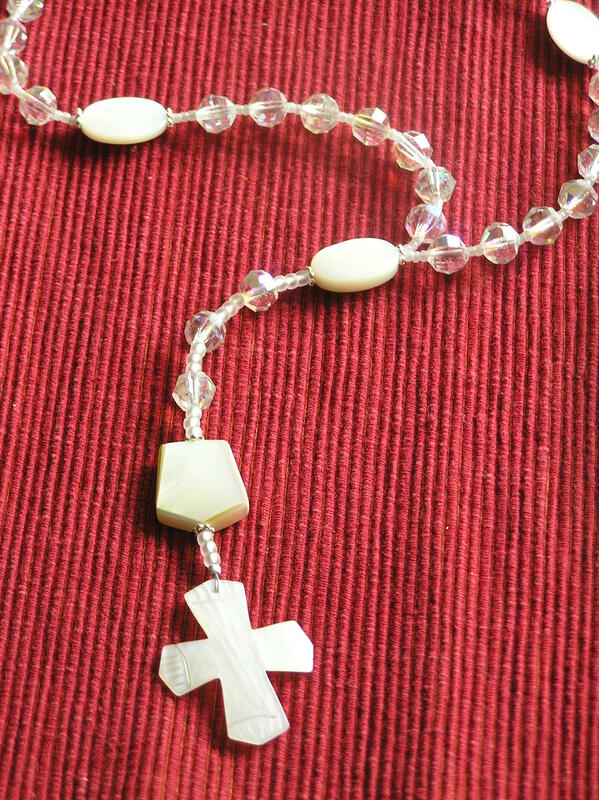 If you have my book, Bead One, Pray Too, you can find directions to make this kind of prayer bead set under “Intermediate Anglican [or Catholic] Rosary” on pages 127-128. If you don’t have the book, you need bead stringing skills that include crimping. That’s about it. Begin with the circlet. String one daisy spacer, one cruciform, one daisy, 3 size 11 seed beads, *one faceted bead, two size 11 seed beads. * Repeat between * and * until 7 faceted beads are strung. String 3 size 11 seed beads, one daisy spacer, one oval cruciform bead, one daisy spacer, 3 size 11 seed beads, one faceted bead, two size 11 seed beads. Repeat in this fashion until all oval curciforms and all but THREE faceted beads are strung. End with three size 11 seed beads and bring working end of wire back down through the first oval cruciform bead and the two daisy spacers on either side of it. Now string the stem. On BOTH STRANDS OF FLEXIBLE WIRE, *string 3 size 8 seed beads, one faceted bead. *Repeat between * and * until all three faceted beads are strung. String three size 8 seed beads, one daisy spacer, the invitatory bead, one daisy spacer and three size 8 seed beads. String the crimp bead and the terminal charm. PULL THE FLEXIBLE WIRE TAUT. String both ends of flexible wire back through the crimp bead and the next three size 8 seed beads. Crimp and clip flexible wire close to beads. If you need a tutorial on crimping, see my blog entry from yesterday.